• Authors Live! :Yoko is going to read her poems and a series of Linked Quatrains, A Chimera Grows During the Thaw, composed with Trane DeVore, Jessica Goodfellow, Goro Takano and Ikuyo Yoshimura. • Jane Joritz-Nakagawa's chapbook, "Wild Black Lake," is published by Hank's Original Loose Gravel Press, March 2014. • Yoko Danno's poetry book, Aquamarine is published by Glass Lyre Press, LLC. • Kiyoko Ogawa's tanka in Eucalypt: A Tanka Journal (Issue 14, 2 013, Australia) is awarded "Distinctive Scribbling Awards." Kiyoko's poetry and essay (both in Japanese) are in "Tsumugu: Vol. 9" (Autumn, 2013). • Jane Joritz-Nakagawa's poem in Truck. Her interview with Eric Selland in The Conversant. Book review, "Fragmented Quest" by Ckyril Wong. This poetry reading is being held in conjunction with the worldwide 100,000 poets for change events. • Date: September 28 (Sat.) 2013, 1:00 P.M. to 5:00 P.M. Directions: It's at Marutamachi Station on Subway Karasuma Line (which you can take from JR Kyoto Station). From Kyoto station the train will take approximately 7 minutes / is 4 stops. Just go out from Exit #5 of Marutamachi station, and you will be standing just below the building of Heartpia Kyoto. • Admission: free; Pre-registration unnecessary. • Open to the public. All are welcome. Languages used will be English and/or Japanese. Readers: Yoko Danno, Trane DeVore, Jane Joritz-Nakagawa, Sean Lotman, Kiyoko Ogawa, Eric Selland, Leah Ann Sullivan, Goro Takano, Atsusuke Tanaka and Ikuyo Yoshimura. Saturday November 17, 2012 / 1:00 P.M. to 5:00 P.M.
All are welcome. Languages used will be English and Japanese. • Admission: free. Pre-registration unnecessary. 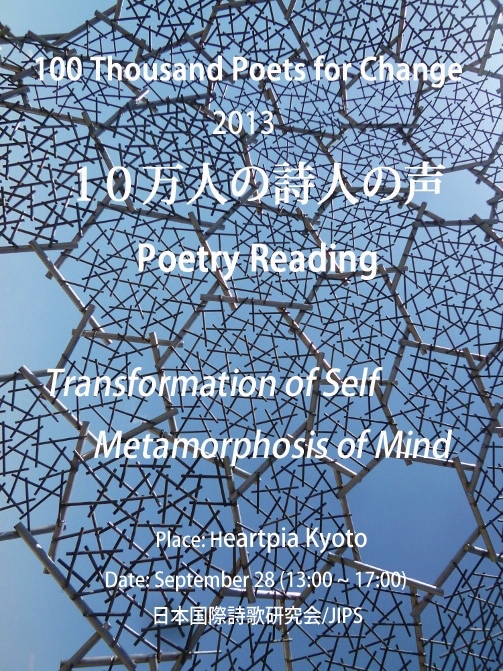 Yoko DANNO is the author of several books and chapbooks of English poetry published in Japan and the USA. A collaborative work, "a sleeping tiger dreams of manhattan: poetry, photographs and music" by Danno, James C. Hopkins & Bernard Stoltz, translated from English into Latvian, was published (Mansards, Latvia) in September, 2012. Her English translation of "Songs and Stories of the Kojiki" was published by Ahadada Books (Toronto/Tokyo, 2008). Trane DeVORE's work has appeared in Mirage, Crowd, First Intensity, Chain, Salt Hill, 26, The Electronic Poetry Review, Poetry Nippon, and many other venues. He has published two books of poetry — "series/mnemonic" (1999) and "Dust Habit" (2005) — both with Avec Books. He currently lives in Osaka and teaches at Osaka University. Loren GOODMAN is Associate Professor of Creative Writing and English Literature at Yonsei University/Underwood International College in Seoul, South Korea and Pacific Correspondent for The Best American Poetry Web Blog. He won a Yale Series of Younger Poets Award, selected by W. S. Merwin, for his poetry book "Famous Americans," and is also the author of the poetry chapbooks"Suppository Writing" and "New Products ". Jane JORITZ-NAKAGAWA (janenakagawa at yahoo dot com/) is the author of seven volumes of poetry, most recently "Invisible City" (White Sky Ebooks, USA). Other 2012 publications include two chapbooks with quarter aft "er press (USA), "flux of measure" and "season of flux," and a poetry broadside, "blank notes," with Country Valley Press (USA). She currently divides her time between Shizuoka and Nagano prefectures. Kiyoko OGAWA is a poet, translator and essayist, writing monthly essays on world literature for "Saku." She has published five English and three Japanese books of poetry, as well as an academic monograph on T.S.Eliot. Her work has been included in anthologies and journals such as "other side river," "Sunrise from Blue Thunder, "Prairie Schooner," and others. Eric SELLAND's new poetry chapbook is "Still Lifes". Translations of poems by Takagai Hiroya and Sekiguchi Ryoko appear in the current issue of "Big Bridge," and his translation of Wago Ryoichi will appear in a forthcoming issue of "ElevenEleven." Goro Takano was born in the city of Hiroshima, and is assistant professor in the Faculty of Medicine at Saga University, where he teaches English and Japanese literature. He obtained his M.A. from the University of Tokyo (American Literature), and his Ph.D. from the University of Hawaii at Manoa (English/Creative Writing). His first novel, "With One More Step Ahead," was published in the US by BlazeVOX in 2009. Atsusuke TANAKA works as a high school mathematics teacher in his hometown of Kyoto. In 1991, the prominent poet Makoto Ōoka identified him in the journal "Yuriika" as a major poetic voice of his generation. Tanaka has published seven volumes of poetry in Japanese, including an ongoing experimental series of poems called "The Wasteless Land" which draws inspiration and quotes from a wide array of sources ranging from pop music to classical Western and Japanese literature. •JIPS members Kiyoko Ogawa and Jane Joritz-Nakagawa will be presenting on "jisei" (swan songs) and ecopoetics, respectively, at the Japan Writers Conference. •JIPS will have an informal brown bag lunch meeting following David Gilbey's Saturday (Nov. 10, 2012) morning poetry workshop, in Room 201, from 12 noon until 12:45 at Doshisha Women's University in Kyoto. All are welcome to join us for this lunch meeting! as well as for conference sessions. • Poems by Arai Takako (trans. by Jeffrey Angles), Ito Hiromi (trans. by Angles) and Yoko Danno are in Poetry Kanto 2012, Issue 28. Take a look.